It has been five years now since Seymour Cray, a mythic figure even while alive, passed away as a result of an automobile accident in the Colorado Rockies. With Cray went the point man for the U.S. high performance computing community, an advocate for building the fastest machine possible at any time, a father figure to aspiring engineers, an Olympian straddling enormous funding requirements and demanding design challenges, in short, the Mozart of MIPS. The machine that established this reputation was the Control Data 6600. It is very important ... that there should be one case in a hundred where... [we] write specifications simply calling for the most advanced machine which is possible in the present state of the art. - John von Neumann, IBM NORC Dedication, Dec 2, 1954. Introduced in 1964, the 6600 was a masterpiece of careful design and blazingly high performance. With 400,000 transistors, over 100 miles of wiring, and a built-in Freon refrigeration system, 6600's sold briskly to U.S. national laboratories and universities undertaking computationally intense work. Ultimately, over 100 were sold at about $7-10 million each, depending on options, moving Control Data from a niche player to IBM's main competitor in scientific computing. Gordon Bell, father of the minicomputer at DEC, recalls: "... Everyone's reaction at looking at the performance numbers was uniformly - "oh my god this thing is fast." How are they doing all of that? ... how was he doing it so fast ... we were sweating to build an order of magnitude slower unit at the time..."
The 6600 architecture featured a central scientific processor supported by ten very fast peripheral processors and is considered by many to be the canonical "supercomputer." (See "What is a Supercomputer?"). It was designed in CDC's Chippewa Falls, WI, laboratory, not coincidentally also Seymour Cray's hometown. 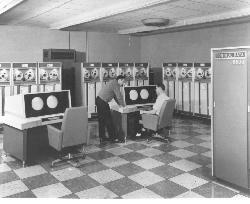 Input to the computer was by punch card or seven-channel digital magnetic tape. Output was by line printer, card punch, or magnetic tape. 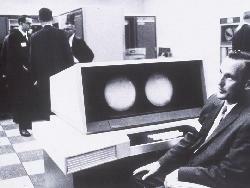 An interactive video display (probably the first computer to have one) allowed users to view graphical results as data were being processed and was novel in featuring two independently configurable consoles. The CDC 6600 had 64K 60-bit words of memory. It was equipped with a large disk storage device and six high-speed drums between central core storage and magnetic tapes. The 6600 supported the FORTRAN 66 compiler and a modest program library—6600 customers typically wrote their own applications and compilers—sometimes even their own operating systems. With just 74 instructions, many computer architects consider the 6600 as being the first RISC architecture, well before that concept was established. Part of the reason may be that Cray did not rely on the literature or write articles—he did things his own way with little reference to the established computing community or its practices. 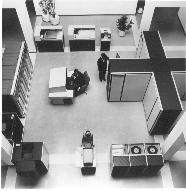 (Many of Cray's RISCy ideas were later solidified in the IBM 801 project led by John Cocke). Cray also just had simplicity bred in his bones. Cray's career followed closely political developments between the two global superpowers. Indeed, without the Cold War, would Cray's machines have found a buyer? According to Eugene Miya, a NASA expert in high performance computing, the answer is probably not. Cray's customers represented the top echelon of the U.S. weapons and intelligence establishments, customers with insatiable requirements for computing cycles and for whom funding was rarely an issue. Cray's engineering style was similar to other 'tall, thin men' working in the penumbra of national security in the 1950s and '60s: like Clarence "Kelly" Johnson (who designed the U-2 in mere months) or General Bernard Schriever (who spearheaded the Atlas missile program), Cray worked in small teams, free of interruption (such as management meetings), and according to his own schedule. This engineering style was in marked contrast with CDC's main competitor, IBM. The 6600 product announcement, in August of 1963, gave Big Blue fits. Thomas Watson, Jr, IBM's CEO, noted in a famous memo to IBM employees: "Last week, Control Data ... announced the 6600 system. I understand that in the laboratory developing the system there are only 34 people including the janitor. Of these, 14 are engineers and 4 are programmers... Contrasting this modest effort with our vast development activities, I fail to understand why we have lost our industry leadership position by letting someone else offer the world's most powerful computer." To which Cray replied: "It seems like Mr. Watson has answered his own question." (namely, IBM was too large). With Cray's lean staff, work progressed rapidly. Of course, there were always challenging design problems to be overcome, but his team was happy to be working under his tutelage and in a part of the country where their modest salaries went far. When asked how he designed, Cray replied that he would work for 3 hours then take a break for "elves" to come in and finish the design. While he may have been joking, in fact real-life human elves, Jim Thornton and Les Davis, made Cray's designs work. Furthermore, Dean Roush, a refrigeration engineer from Amana, played a key role in ensuring Cray's machines did not melt from their own power dissipation. Realizing this reliance on the skill sets of his closest lieutenants, Cray distilled his design methodology as the "five Ps": packaging, plumbing (bits and heat flow), parallelism, programming, and understanding the problems or applications. He might also have mentioned "politics," which drove the purchasing decisions of most of his customers. The 6600 ushered in a new era of the awe-inspiring number cruncher, one that Cray dominated largely on the strength of his own quiet personality and ability to deliver, for the next 20 years. This remarkable machine also inspired the next generation of computer architects, and many of the concepts it pioneered appear in the microprocessors of today. CDC 6600 S/N 1 forms part of the permanent collection of The Computer Museum History Center. X38.81. Thornton, James, "Design of a computer: The Control Data 6600," Glenview, Illinois: Scott, Foresman and Company, 1970. [Out of print]. Murray, Charles, J., "The Supermen: The Story of Seymour Cray and the Technical Wizards behind the Supercomputer," New York: Wiley and Sons, 1997. Patterson, David, A., "Reduced Instruction Set Computers," Communications of the ACM, vol 28. no. 1, (January 1985), pp. 8-21. Seymour Cray at the CDC 6600 Product Announcement, August 1963. Defining "supercomputing" can be a challenge, given the constant stream of technologic innovation. Eugene Miya's parallel computing FAQ provides some definitions given by some well-known figures in the supercomputer community. "A supercomputer is a device for converting a CPU-bound problem into an I/O bound problem." "A Supercomputer is the one that runs your problem(s) the fastest." "A supercomputer is one that is only one generation behind what you really need." "Hardware above and beyond, software behind and below." "A machine to solve yesterday's problems at today's speeds." Performance: Fastest computer in the world from 10/64 to 1969 (CDC 7600 introduction); approx. 10 MIPS. Architecture: Load/store with functional parallelism (I/O adaptors and channels, PPUs, multiple execution units); multi-threading via PPUs; 8 word instruction stack; no paging or memory segmentation. 10 independent functional units in the Main Processor included: 2 floating point Multiply unit (1 microsecond); 1 floating point Divide unit (3.4 microseconds); 1 Add and 1 Long Add unit (0.3 microseconds); 2 increment (used for memory access), 1 branch, 1 Boolean, and 1 shift unit (each 0.1 microseconds); 10 (optionally 20) built in "Peripheral Processors" (PPs)-these controlled the main processor, operated the control console (including painting the alphanumerics in vector mode), and performed all I/O. Technology: Transistor (400,000), Direct Coupled Transistor Logic (DCTL).